Do you have a plan for your next music release? This can be a single, a music video, an EP, or an album. In our most popular series The Musician’s Guide to Marketing Plans, which we call Total Tuneups we address the overlooked importance of having a marketing plan in place and went through the first five of fifteen elements to keep in mind when building a long-term strategy. Here in Part 2, we break down the next five elements for releasing new music so you don’t miss a single opportunity. If you didn’t get the chance to read through Part 1 – The Nuts & Bolts I encourage you to please do so before reading this. This series comes from many years of collaborating with record labels and brilliant managers. What we noticed separate the best artists and teams who get results vs. those who are floundering is planning. Take a look at the Part 2 VENN diagram which visualizes your Musician Marketing Plan. For each part, we have highlighted the sections we are covering in red so you can see how all of these parts work in concert with one another. Back in the day when labels were more focused on artist development they had entire departments dedicated to planning and growth. Sadly, today artists are expected to come to the table already fully developed with large engaged fanbases and proof of growth. Even if you don’t ever want to be on a label this is what will sustain you for the long haul. There are 15 elements to keep in mind when creating a music marketing plan. Here are the 5 areas that need to be addressed around any release before any official announcements should be made about a new single, EP, or album coming out. 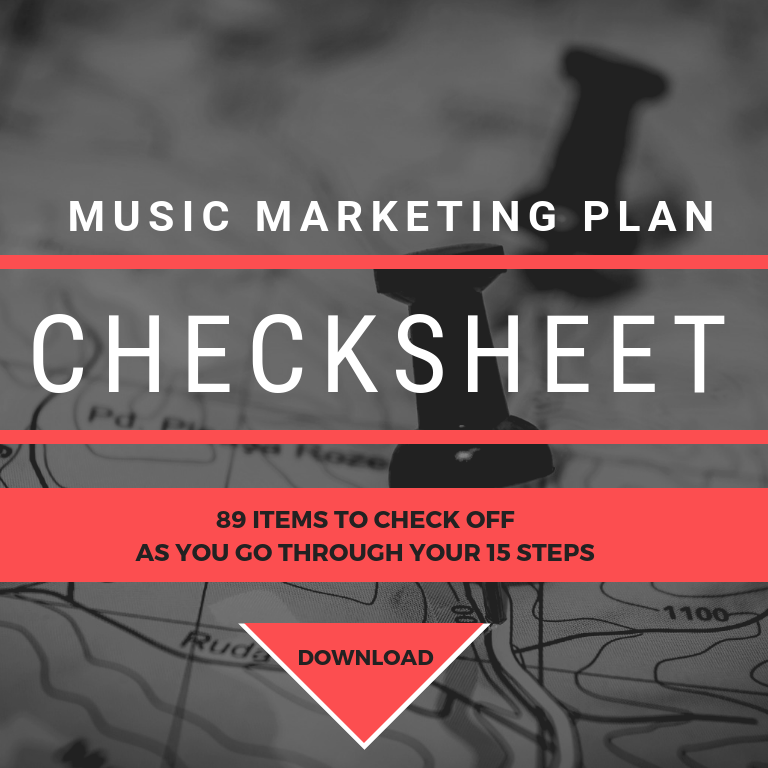 To check off the 89 elements we have further broken down for you download our Music Marketing Plan Checksheet as a compainion to this series. 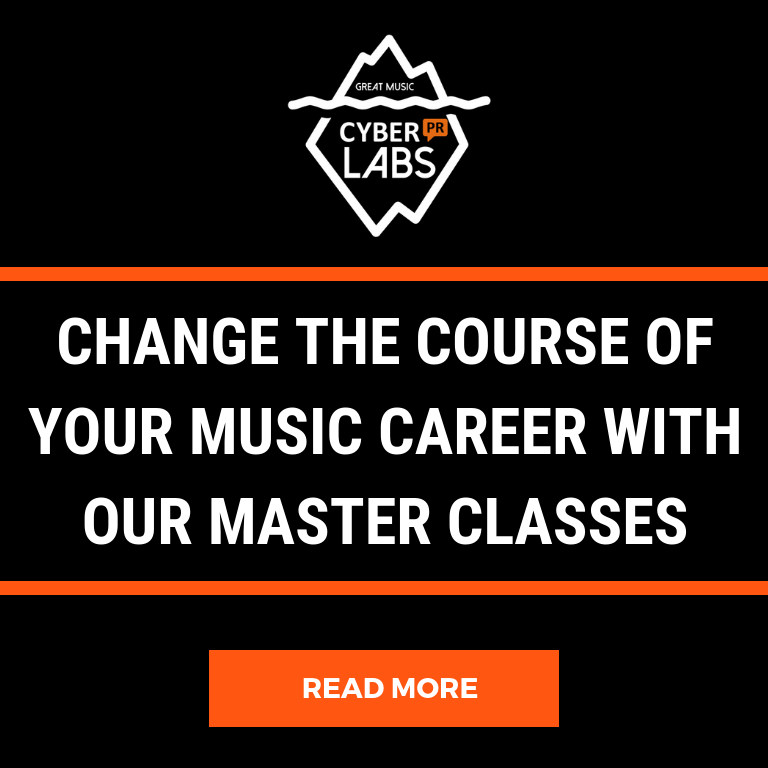 We have a LAB that teaches you step-by-step how to plan your next music release with ease and you will get a community of like-minded artists to support you. Read all about it here. Planning is everything as you can’t stuff the genie back in the bottle after the release is out! If you struggle with managing your time this will help. Watch this 12-Week timeline come to life in a special video musicians masterclass I gave in New Orleans. Register With A Performing Rights Organization. You probably already know this but just in case – to collect your royalties you’ll need to sign with a both a Performing Rights Organization (“PRO” for short) and SoundExchange. The three options in the U.S. for PRO’s are ASCAP, SESAC, and BMI. For live royalties, BMI and ASCAP both offer portals to collect royalties from playing live. Once your songs are registered on the PRO database, you log in and enter any dates you have performed those songs, where they were performed, and which songs. The PRO companies payout quarterly so be sure to enter the performances soon after they are through, otherwise, you could miss a deadline! You also have to register with SoundExchange, which focuses on royalties for your recording (mechanical rights), while your Performing Rights Organization focuses on royalties for your song (performance rights). What may feel mundane to you – writing, recording, mixing, mastering, being in the studio, etc. can be really exciting for your fans. Taking them on a behind-the-scenes journey of this music release is a great way to form a stronger bond with your current and growing base. Send updates on how the recording, mixing and mastering is going using videos and photos via your socials, plus capture longer-form stories for Instagram Stories and for your newsletter. Engage with your following on milestones like artwork and song titles by polling your fans and holding contests to select what cover or title to go with, have your fans weigh in on photos, graphics and get them involved with the process. The goal of all this activity is to get people excited so they are engaging and sharing your updates. A big component when releasing new music is getting PR. You can accomplish this by hiring a team or by going the DIY route. When hiring a PR team make sure you do your homework and make sure your music is a good fit for that firm’s approach and philosophy. 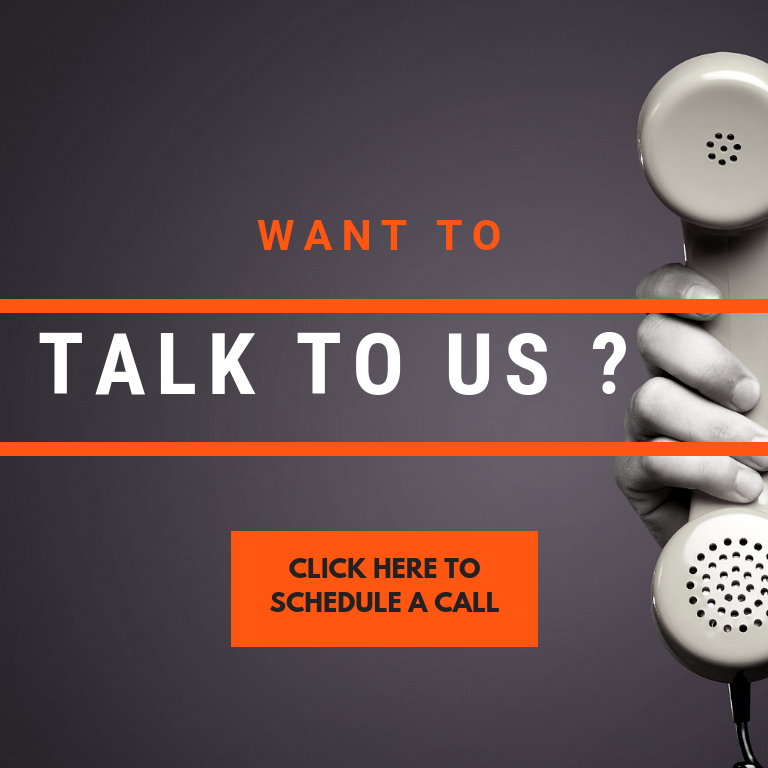 Be sure that the team talks to you about their well-thought-out plan for your campaign. A PR company should work with you to make sure you are fully prepared before you are introduced to the press. This is the first part of their job when you engage a firm. Simply sign into your artist account (or Spotify Analytics if you are a label) and choose your best song. When submitting take extra care to give a detailed description of the song supplying any and all relevant information about the song to easily guide editors to the best for place your music. This is, of course, easier said than done! It is not easy to find curators but it is possible with some dedication. Google and all the Socials are great places to start. Reddit has an active Spotify Playlists Page. There are also quite a few on SubmitHub you can access for a small fee. Your Artwork should be ready and look on brand and amazing! Ask your designer to animate it, break it up into tiles for Instagram and or resize it for all your social posts. You will need to run a campaign to get that Spotify track presaved! There are a bunch of great sites to choose from. Feature.FM has Action Pages to help build your audience – Click Here to create one. From The Site: Action Pages are highly engaging pages that reward fans for taking the actions you want in the platforms you want and provide you with deep insight into your audience. Toneden can also facilitate social media follows/likes and/or email addresses for free downloads. Learn more about the platform here. You can also optimize Facebook ads via Toneden, and customize those ads more than you can under the Facebook Ads Manager. Show.co is owned by CD Baby and is integrated so you can use it as well (we can discuss which pieces to pick and choose on coaching calls. If you have been recording new music you may have taken your eye off of the constant grind it takes to keep your socials and your newsletter growing. This takes a lot of heavy lifting and your whole band or team should be helping. Use my Social Media Tuneup system to diagnose each one of your sites and socials and get them updated. If you have not kept up consistently find your friends and people you admire (bloggers, other artists, venues, local spots you like to hang out in, etc.) on Twitter, Instagram, and Facebook and friend away! This will increase your audience because as many of the people you follow will follow you back. Also, start reaching out to people in your inbox and outbox and get them on your list (remember it’s illegal to just sign people up, so do this with integrity and ask each person). Your newsletter is the place where you will be able to monetize so, don’t skip this step. Your content calendar is outlined with all of the assets that you need for your release with dates for each asset/action needed. Countdowns, art reveals, listening party of live release party announcements, ticket links and calls to action (like Spotify Presaves) are all fodder to add to your content calendar. Use my SMM tracker to organize all of your posts and your VIPS. This will help you keep track of all the content that you will post. You can see there is a tab for each platform. If there are several of you in a team or in a band, assign one platform per person. You will also see a VIP tab here this is where you will add industry people you need to connect with in real life (more on that below). If you are leading this music release with a single (or two) make sure to let them know you are releasing a single(s) FIRST before the EP (if this is the case). You must have your single artwork ready at this time! Tunecore, CD Baby, and other aggregators like 4-5 weeks to pitch your music to iTunes, Spotify, Google Play, Amazon Music, and other digital service providers (DSPs). Or if you have not done so in a long time go through your personal Facebook Page and ask all of your friends to Like your Page. This is a great way to build buzz, get fans excited, and also get some music bloggers interested. Any reviews you can place will help build your overall online profile. On the press side of the house aim for appropriate blog targets. If you are a brand new artist Pitchfork is probably NOT appropriate. Go for smaller, more targeted music blogs! That being said, be sure to reach out to your “within reason” dream targets with your single(s). It’s not the best idea to wait to reach out to these loftier sites with your album. If you don’t play out, create a listening party at a small bar, create an after-work happy hour, or choose a local favorite coffee shop. If you are just starting and don’t think you can draw a large crowd, hold a listening house party with wine tasting, cupcake bake-off, fondue party, etc. Think about your fans and make this special for them. And, of course, the key is to announce that tickets are on sale and share links! This is a great way to build buzz, If you are hiring a PR team this will be when they will launch. Keep the excitement up on your socials by scheduling countdowns across your socials. Write your Day of Newsletter so it is ready to go out. Make a fun video about the release – and Boost! Post a status update announcing your release, and pin it to the top as a timeline feature. Header and Profile Photo: Keep these up to date and in line with the rest of your social profiles. Image Gallery: Choose images most aligned with your brand and recent music. Social Media Links: Add links to your socials. Here’s a How To from Spotify on adding those and an image gallery. Spotify Bio: With 1500 characters to share with your fans, you can update this whenever it makes sense for you. Keep your bio updated, include shows, notable press, and new singles. Add an Artist’s Pick: You can designate a song, album, or playlist as the “Artist’s Pick.” This will appear at the top of your profile with a note from you. You can add a custom image to your Pick or share tour dates if preferred. Read more here. tweet out your release announcement. Send out a newsletter announcement to your mailing list. PR takes time and effort to execute well. Sadly, many artists believe that PR = blasting a press release out to the top 100+ music sites that they Googled. This never works, because PR placements start with astute research. The cornerstone of your brand is your bio. You will need a solid story to build your marketing and PR from. We suggest hiring a professional to write your musician bio, which we call a signature story around here. Even if you are a strong writer, it can be challenging to write about yourself. A professional writer will be able to craft a compelling bio that effectively conveys all the important details while keeping the audience in mind, which in this case includes press and music industry. Read our 5 – Steps guide here or We would be delighted to write one for you. If you feel like you still need a boost, listen to the Signature Story Webinar. The first people to target should be local press and outlets that have covered you in the past (if applicable). When contacting blogs make it personal. Be sure to research which writer/journalist of the site is the best or most appropriate. Always include a Soundcloud link (set to private until your music is released). Follow our full music PR guide for more detail on how to handle this process. Learn how to do your own PR with Ariel in her amazing deep-dive course. Start to familiarize yourself with blogs, podcasts, and outlets that are appropriate for your release. If you live in a smaller town (read: Not in NYC, LA, or Chicago) there may be some local press that you can go for. Research is not the only thing you need before you send your first pitch. To find out what to do come download our Ultimate Guide to Music Publicity. TIP: Keep in mind that a music blog is made up of content written by humans. When it comes time to pitch, you will be pitching to them. Increase your chances that they will be interested in you by first being interested in them. Make a connection by following them on socials. Strike up a conversation on Twitter or Instagram if the opportunity arises. A conversation about literally anything other than your music is recommended. This way when you send an email (or if a publicist does for you), there could be some familiarity and existing relationships that will help in getting your emails opened and help your new music be featured. You are responsible for driving likes and streams to Facebook, YouTube, Spotify, and all other streaming sites. You also need to drive subscribers to your email list. Marketing platforms are key tools that will help you to get your fans to take powerful actions that will pay off forever like saving your profile/track on Spotify, subscribing to your YouTube channel before watching a video or liking your Facebook Page as they visit. In a saturated, crowded space (approx. 20,000 new tracks are added to Spotify each day according to DMR) these platforms are vital. Read this post to understand Feature.fm, Toneden and Show.co. We use all of them here and they are deeply incorporated in our Total Tuneups. There are undoubtedly limitations on how often you can tour. More than likely won’t be able to tour every market and for this, we have a solution…. No Shows? Try Live Streaming! Streaming a show is also a great way to interact with your fans on a more personal and direct level. A live streaming concert is where the audience is online viewers and can be filmed at your home or any interesting location have access to, a great tool to connect with fans. Artists, big and small, are taking advantage of this to keep engaged and present with their current fanbase, generate revenue and to increase their brand awareness. You can stream on Facebook and Instagram, however more robust platforms offer features geared towards creating “official” shows. The two major players are Stageit and Concert Window. Picking between the two (they are both quite similar) will allow you to either charge a set ticket price. What many artists do, is use the pay what you want model which gives fans a way to pay you more tha what you ask for and can be lucrative. Keeping the shows fresh and different will help with increasing viewership from show-to-show Play a game at the end of the performance or midway through using the chat features. Trivia would be a very easy game, where fans could win merch or other prizes. Ask your fans what covers you should play. Post the question on Your Facebook Page or on Instagram as a tile. The song suggestion that gets the most likes or comments will be the one(s) you cover. This is a great way to add a new element to the live stream while cross promoting to each other’s fans at the same time. Our LAB 5: Mobilize Your Fan Army teacher and client Eli Lev did this with 2 other musicians and covered Fleetwood Mac. 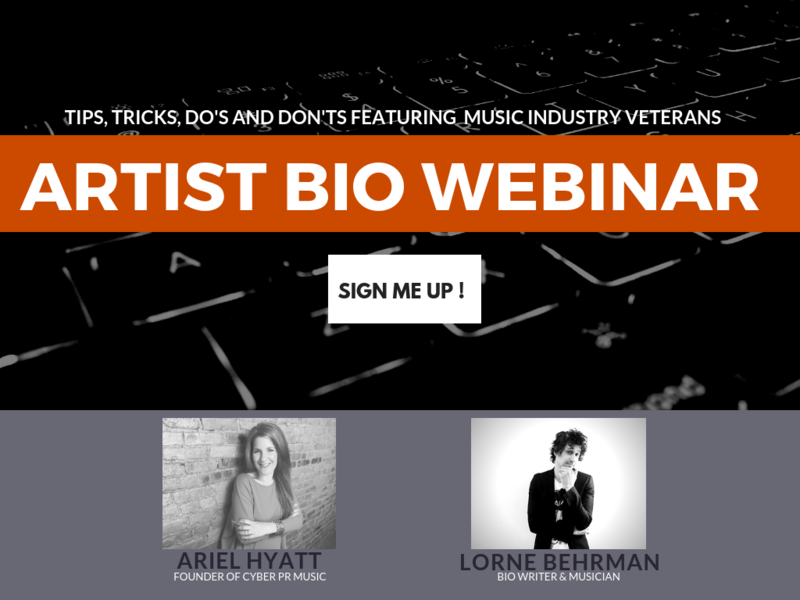 You will not make it in music without mastering the power of live networking. That’s the problem with all of the digital tools available to us: Way too many artists believe they can hide behind a screen and launch the careers of their dreams without ever talking to other humans face to face. Building your IRL networking into your planning is key. Many artists are shy and introverted and this part does not come easily. Gain a sphere of influence, and a source for referrals (more fans) as everyone is connected online and offline. 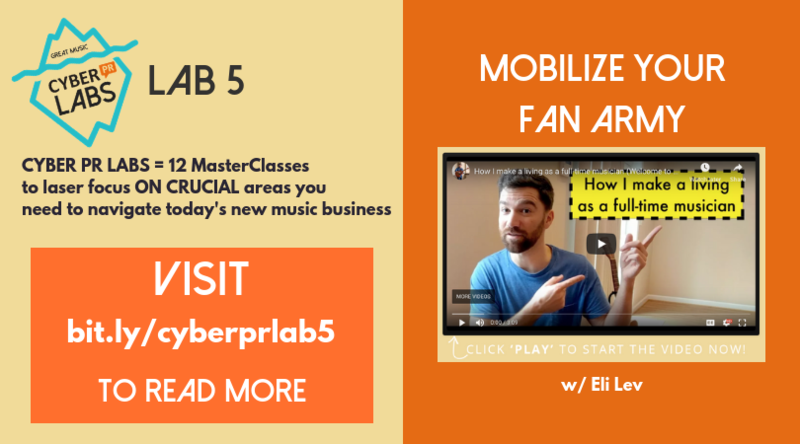 Eli Lev is a master networker and he teaches you step-by-step how he networks in LAB 5: Mobilize Your Fan Army. He is so good at this that he has over 100 fans supporting him every single month on Patreon and he did it through IRL connecting. Here are some real-life networking tips in my article that I learned from Larry Sharpe who is such a master at networking that people literally line up to talk to him at events. I know this because when I met him I stood in line to do so! This exercise will help you identify who your fans are and how to reach them. 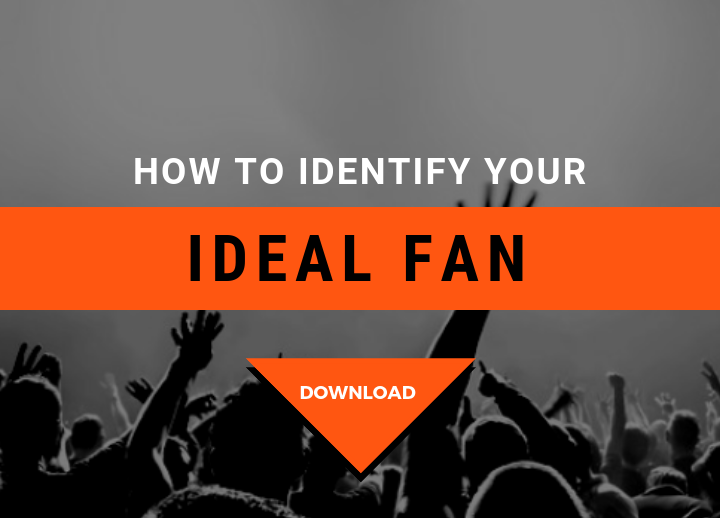 It includes 10 strategic, thought-provoking questions and walks you through how to identify your ideal fan archetype. Knowing your fans will prepare you for the ongoing momentum needed specific to your audience which we will talk about in PART 3. Come and dive in! Great post! Thank you for this piece. You made my day. Glad you liked it Debby! This is REALLY a magical, very informative read. Thank you SO much for this! Thanks Ariel, excellent summary, check lists and advices as we’re preparing the next album release right now – You Rock! Ugh I LOVE THIS so much. This makes a complicated process super clear. Thank you!! I am absolutely blown away! I am a multi platinum songwriter debuting my own music for the first time essentially. and I am just speechless with this article. So giving and im so thankful!